Many Concussions Causing Memory Problems? I am a 42 year old female. I have been dealing with panic attacks, depression, and headaches for as long as I can remember. I have been on so many different meds with minimal relief (Zoloft, Xanax, Vicoden). I cannot hold a job, and I have trouble even getting up and showering and starting my day. I see people who know me by name in stores and restaurants and I have no idea who they are although I KNOW somewhere within me I should. I forget stories that people tell about me. I laugh along, but I do not recall them. It seems to be getting worse. As I have thought about this, I started researching early onset Alzheimer's, as my maternal grandmother had this quite young and died at age 72. One thing I am also considering is a traumatic brain injury (TBI). When I was in 5th grade I had a blow to the back of my head that required stitches. No MRI or CAT scan was done. I have also had a few very bad closed concussions in the last 6 years. My question is, could all of my mental symptoms be related to a TBI? I don't know what my next step should be. And I'm EMBARRASSED to bring this up to my family and husband as I play down my memory symptoms. I would appreciate any info and help. Thank you. Doug's Reply. As reported by the Centers for Disease Control and Prevention (CDC), symptoms of TBI do include headache, memory problems, impaired thinking, and depression. Considering your history of blows to the head and concussions, it would make sense to explore TBI as a potential cause of your issues. 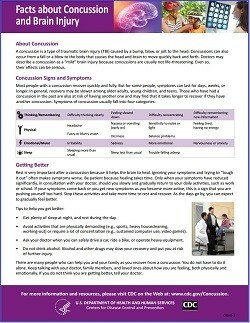 "A concussion is a type of traumaic brain injury (TBI) caused by a bump, blow, or jolt to the head... concussions are usually not life-threatening. Even so, their effects can be serious." You mention being embarrassed. But really, the only way you can find out if the concussions are the cause and if there's any treatment is to consult with your doctor. As a possible next step, your physician might recommend cognitive assessment and neuropsychological testing. Detailed testing is typically administered by a neuropsychologist or neurologist in cases where brain disease or injury is suspected. 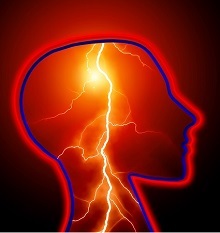 Depending on the results of your evaluation, the doctor may recommend a brain scan such as CT or MRI to determine if physical damage can be seen in the brain. They may request blood tests. From there, the physician may suggest additional tests and ultimately a treatment plan. These are just some possibilities. You need to work with your doctor to determine the proper course. Mainly, though, don't allow embarrassment to prevent you from seeking help. From what you've said, this situation causes you emotional distress ever day and interferes with normal functioning. The best way to determine whether solutions exist and get some relief is to consult the appropriate medical professionals. Also, keep in mind some conditions that cause memory difficulties, such as vitamin B12 deficiency, normal pressure hydrocephalus (NPH), and thyroid problems, are treatable. It would be tragic to not seek medical help in a situation where an actual remedy exists.